This Assyrian festival was organized by the Assyrian Welfare Association of Syria. by Salim Abraham, Associated Press. Published on Monday, April 1, 2002. 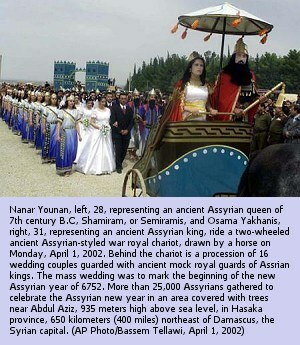 HASAKA, Syria (AP) – With a historical pageant evoking the glory of the ancient Assyrian empire, more than 25,000 members of Syria's Assyrian community saw in their New Year of 6752 on Monday. 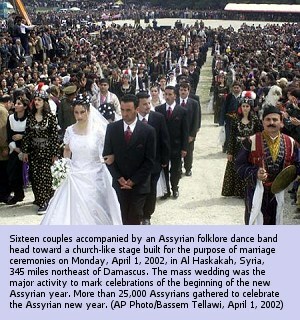 They also celebrated Nissan, as Assyrians call the April 1st festival, with the wedding of 16 couples performed on a stage in an arena in this northern city, 550 kilometers (345 miles) northeast of Damascus. The couples were escorted by men dressed in the uniforms of the royal guards of the Assyrian empire, which, at its zenith between the 9th and 7th centuries B.C., stretched form the Gulf through modern-day Iraq, Syria and Turkey to the Mediterranean Sea. 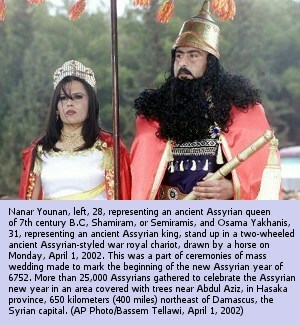 “By acting as king, I revived history,” said Osama Yakhanis, 31, who drove the chariot in royal costume along with his “queen,” Nanar Younan, 27, who was dressed as the mythical Assyrian queen Semiramis in a red dress with yellow and white embroider. “I participated in this mass wedding for the greatness of the day for Assyrians,” said groom Senharib Gabro, 33, a member of the Syrian Orthodox Church. “I feel very happy today,” she added. “The money was donated by Assyrians from all towns of al-Jazeera, (or Hasaka province that include the farthest northeastern city of Qamishly),” he added. “The church doesn’t mind celebrating this historical day as I can’t deny it that I am an Assyrian (ethnically),” he added. In 1552, a group of Assyrian Church decided to seek union with Rome. In early 1553, Pope Julius III proclaimed Youhana Sulaka as Patriarch Simon VIII of the Chaldeans. Eventually, Sulaka’s group returned to Assyrian, or Nestorian Church of the East. As late as 1830, Pope Pius vlll confirmed Metropolitan John Hormzidas as head of Chaldean Catholics, with the title of Patriarch of Babylon of the Chaldeans, with his see in the northwestern Iraqi city of Mosul. “It’s good to see Assyrian people celebrating their national heritage in such a meaningful way,” he added. The Assyrians are spread across the world, with about 70,000 in Chicago. The head of Assyrian Women’s Union is Sweden, Elisabet Nison, had come to al-Hasakah to attend Monday’s celebration. “Nissan is a message for all the world that we, Assyrians, still exist,” Nison said. Meanwhile, in qamishly, 85 kilometers (50 miles) north east of Hasaka, some 5,000 Assyrians celebrated the New Year on a heavily raining day. The Assyrian population of Syria is estimated at more than 150,000 people, of whom about 90,000 live in Hasakah. While they enjoy freedom of worship, some Assyrians seek minority status in order to promote their language, Syriac, which is currently only taught in Assyrian churches. “We call on the government to recognize Assyrians as a national minority, not only a religious one,” said Aziz Aheh, and executive of the Assyrian Democratic Organization. winter; spring has returned and good has won over the evil. Through their long historical existence, Assyrians have witnessed many massacres. The last was in August 1933 in Semeleh, a northern Iraqi town. The massacre, perpetrated by Iraqi Rashid Killani’s government, is believed to have claimed the life of 5,000 Assyrian women, children and men. The earliest sign of municipal administration (kingship in pre-historic sense) appears during the Halaf Period in Mesopotamia (over 7,000 years ago). goddess-worshipping culture and the distinctive colored potteries with geometric designs pointing to the existence of a high- culture civilization in Mesopotamia.